This is quickly becoming a tradition in our house on Christmas. 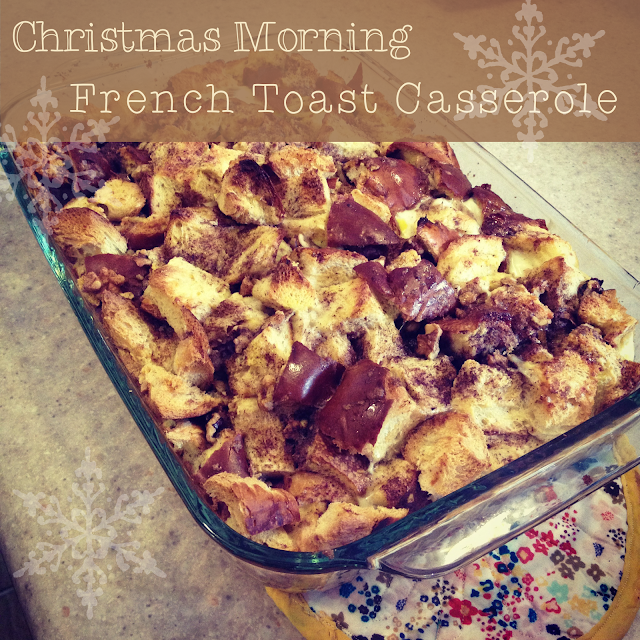 This is an easy breakfast dish to prepare the night before so that all you have to do is throw it in the oven when you wake up Christmas morning. By the time all the presents are opened, it will be ready to enjoy. 1. Cut the bread into 1" cubes. Set aside. 2. In a separate bowl, mix brown sugar, cinnamon and walnuts. 3. Layer half the bread in a greased 9x13 casserole dish. Cover with half of the sugar mixture. Repeat with rest of bread and sugar mix. 4. In a large mixing bowl, whisk together the eggs, milk and vanilla. 5. Pour egg mixture evenly over bread. Gently press down bread so that even the top layer soaks up the milk. 6. Cover & set in refrigerator over night. 7. Bake in oven at 350 F for 20 minutes. Remove foil and bake an additional 30 minutes. Yummy! I have to make this! I just came across your blog! I would love for you to check out mine, maybe we could follow each other? I just googled this because I couldn't find it on the blog and I really need to eat french toast! lol It has now been pinned.